A detailed planning application for 85 new homes in the Canalside area of Wichelstowe has been submitted by architects Metropolitan Workshops on behalf of Swindon Borough Council. The choice of 1, 2, 3 and 4 bed homes for sale will be located to the north of the existing Waitrose store and be situated along both banks of the canal. Subject to planning permission being granted, construction will start early next year and the first residents should move in during Autumn 2018. Site preparation will commence this month with advanced works to improve the canal. The design of the homes has been led by architects Metropolitan Workshop, who were voted Building Design’s 2017 Architect of the Year in the masterplanning and public realm category. Working in partnership with local architects Stonewood Design who themselves won the Small Project Architect of the Year award in 2016 the proposals will deliver a unique, and quality, housing offer for Swindon. The homes will be set in four semi-private landscaped garden squares to maximise the views over the canal. 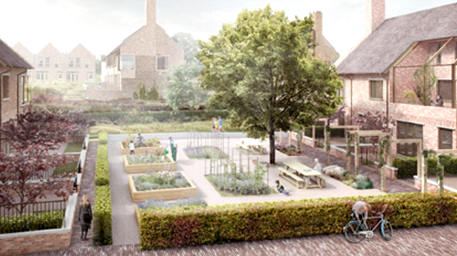 Each home will have its own private garden and terrace but will also have access to the shared communal gardens, places to gather socially and for children to play safely. If approved planning permission should be granted in December.